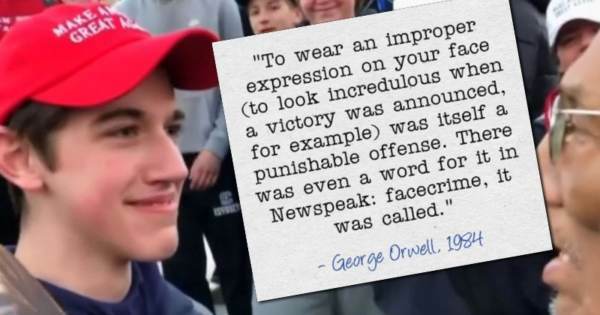 Covington and Orwell's "Face Crime"
Thread: Covington and Orwell's "Face Crime"
#1 Covington and Orwell's "Face Crime"
After being heckled by black racists, a far left Native American activist approached Sandmann, got in his face and loudly beat a drum while chanting. Hopefully our laws are keeping-up. Your face is going to be Free Speech all day long, far into the future. There are still assholes out there ( a nice number of them at DU ) who even after watching the whole video and finding out the truth still want to hurt ( some even want to kill ) the MAGA hat kid, all the rest of the boys there, and the school. Why? I think that these jerkazoids have been living too long in their own private little bubbles across the country and now they are more then ready to destroy anyone who challenges their PC religion/cult even in the slightest way. SJWs, BAMN, ANTIFA have been ready to smash all who dare reject their belief system for some time now; the next time somebody might get killed by some assholes's fake news story. So true and a most dangerous sign of the times in which we are now living. Makes me want to go back and re-read for the umpteenth time his book, which I have up in Georgia, and not down here. That book unfortunately, is becoming more relative and scary as time goes by these days. Their prejudices do not allow them to think any other way.